Bird Feeders Made in the USA by Looker Inc. Our clients include over 650 specialty stores nationwide. Looker is a leading manufacturer of Window Products. 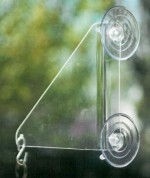 7" x 6" x 8"
Versatile window bracket great for hanging hummingbird feeders, fruit feeders, wind chimes, and more! Suction cups rated to hold up to 5#. Comes with "S" hook attached to hang miscellaneous items from. Has 2 large suction cups. Comes with green SE536 or brown SEWP01 perches. Holds 1 cup of seed. 6" x 4" x 5". This is a great starter feeder! Polyproplene mesh in bottom for drainage. Holds 6 cups of seed. 12" x 6" x 2-1/4". Dual-purpose feeder may also be used as a greenhouse to start seedlings. Holds 4 cups of seed or an egg carton. Feeder removes off of bracket for easy filling or cleaning. 15" x 6" x 7". Roof pivots for easy filling. Holds 2-1/2 cups of seed. 10" x 4" x 6". Has 4 medium suction cups. Feeds at both ends and protects the birds from the weather. Holds 4 cups of seed. 13" x 5" x 5". Has 2 large and 2 medium suction cups. 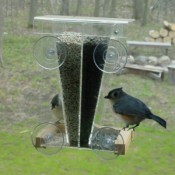 Easy to fill open feeder. 10" x 3-1/4" x 5". 2" x 7" x 12". Feeds two types of seed at once. Roof pivots for easy fill. Holds 7-1/2 cups of seed. 7" x 5" x 10". Has 4 large suction cups.